In the middle of a drab, cold February, my book club met at a local restaurant and decided that instead of talking about one book selection we would allow each member to talk about her favorite book. It was a lovely evening, a bright spot in a dark month for sure, and the highlight was hearing each person talk with such passion about a particular book, but more about her love of reading. The reading bug had hit most of us early in life, and continues to this day into our senior years. To encourage this love of reading in others who may not have had the opportunity to pour through books as a child, World Book Night was created. 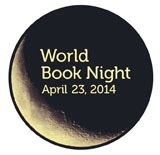 The program allows volunteers (avid readers I am sure) to place a particular book in the hands of light or non-readers on April 23, 2014. The program continues through the year, and new volunteers will be solicited for the 2015 event.